Much has been written about the breaking of the fourth wall, that imaginary barrier at the edge of a proscenium stage, clearly defining the acting domain from the audience’s territory. It has also been many decades since experimental productions and what we now call immersive productions first sought to shatter that barrier, either from the very start of a show or at some strategic moment within it, for maximum effect. But the fourth wall remains intact for countless shows, even those where the stage is a traverse, thrust, or in the round, with actors on one side and audience on the other. A raised stage helps to define the separation, but the convention is fairly well understood whether there’s a change in topography or not. The Young Vic production of Yerma went so far as to encase the entire production in a clear box, as if we were watching a show set inside a home aquarium or terrarium, the barrier heightening the sense that the audience was observing the action from a safe distance. 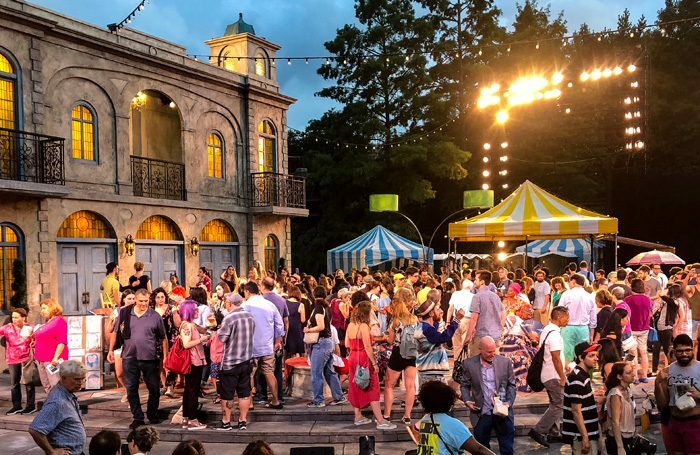 Entering the Public Theater’s Delacorte Theater in Central Park for Kwame Kwei-Armah and Shaina Taub’s musical adaptation of Twelfth Night, which concluded its run this past weekend, the fourth wall was already down. Audience members mixed with members of the large company in a street fair atmosphere on the ultra-wide stage, with face painting, caricature artists and the like on offer. Even in a space as open to the elements as the Delacorte, this intentional erasure of the barrier would influence all that followed, even if audience members returned to their seats as curtain time approached, in a theatre with no curtain – or roof, for that matter. It was particularly apt as part of a show that began as a project of the Public Works initiative, which mixed professional actors with a large company that included dozens of ensemble members drawn from the local community, erasing the demarcation between professional and amateur. The convention of the fourth wall is deeply ingrained in most regular theatregoers, and indeed the Delacorte was the site of an egregious violation of that division just last summer, when a protestor disrupted The Public’s Julius Caesar, over a depiction of the Roman emperor and his court that strongly resembled the current US president and his cronies. Without permission, someone breaking the barrier was disruptive, even dangerous, and widely decried. But when such techniques are deployed intentionally before, during and after a performance, the effect can be magical. As it happens, one of my earliest recollections of a production that tore down the fourth wall even before it officially began was another Twelfth Night, Mark Lamos’ production at Hartford Stage in 1985, the first of 50 shows I would work on there. To the strains of Lionel Ritchie’s All Night Long, the audience was invited on stage to dance with the company until the music wound down and the patrons were directed back to their seats. The suddenly empty stage lent a particularly melancholy to Orsino’s opening lines – “If music be the food of love, play on” – precisely because so much of the audience had been participating in a now-ended party. In the Delacorte’s staging of Shakespeare’s play, the show opens with a raucous song, entitled Play On, which seems less the mourning of a party that has ended but rather a scene-setter for the party that will continue throughout the 90-minute production. Even at the end of a show, after the curtain call, bringing the audience on stage can have a felicitous effect. When Alan Ayckbourn’s House and Garden debuted at the Stephen Joseph Theatre in Scarborough, the garden fete that is much discussed throughout the paired works materialised on the set of Garden, with audience members playing games of chance organised by the very actors – or were they characters? – with whom they had just spent several hours. When the show reached the National Theatre the following year, the fete was recreated, but in the lobby rather than on stage. Some productions have even made the audience part of the show with onstage seating. Whether because of artistic intent or economic imperative, stage seating – seen in New York for several Mark Rylance-led productions at the Belasco Theatre including Twelfth Night (again), as well as for the recent revival of Inherit the Wind – blurs the demarcation and makes the audience complicit in the action of the show, since they have some of their peers in sight at all times. When I saw the Rylance Twelfth Night, the line was further blurred when an audience member in the onstage seating fell ill, and the show was stopped so that they could be receive medical attention. There needn’t even be a show in performance for the effect of bringing audiences on stage to have an impact. Even in smaller spaces, let alone iconic ones, allowing patrons to stand where the actors perform creates an inversion that can be highly affecting. Theatre tours that allow visitors on to the stage to look out at the house, be it intimate or vast, can have a lasting impact, as those we seek to bring into the theatre experience the actors’ view during a performance. If you talk to someone outside the theatre professional who has been given that privilege, I wager they will wax rhapsodic over this rare opportunity. Much as I wrote last week about the benefit to professionals of meeting those who stand for hours to buy rush tickets, those of us for whom walking across a stage has become part of our jobs, a commonplace experience, would do well to remember a time before we were afforded that access, and think about how best to unleash its significant allure and impact. Because these thoughts were prompted by the Public Works Twelfth Night, it’s appropriate to mention that this particular model of mixing professionals and amateurs for specially written productions, pioneered by the Public Theater at the Delacorte, is beginning to proliferate. The National Theatre’s Public Acts production of Pericles, running this weekend, is directly inspired by the programme. Next weekend, in the US, Hudson Valley Shakespeare Festival, an hour north of Manhattan, will present its new retelling of Rip Van Winkle, also the result of an epiphany by the company’s artistic director Davis McCallum at a Public Works show. And the Kwei-Armah/Taub Twelfth Night makes its UK debut in October at the Young Vic. This just proves that there are many ways to blur lines in the theatre, beyond full immersion or selective audience participation. Some are already time-honoured and others new, but all benefit the audiences and the art.